Discover Sydney's most famous beach, Bondi on a 1.5-hour easy walking tour. From its Aboriginal beginnings to the celebrity, hipster and tourist mecca it is today your local guide will take you on a journey to discover what makes Bondi ‘Bondi'. Walk the beach and the backstreets as your guide gives insight into Bondi's beachside culture and shares local tips. The tour has options to be extended to include the famous coastal walk from Bondi to Bronte or further south to Coogee. Climb onboard Sydney's fastest commercial vessel for a coastal journey like no other. Departing daily from Circular Quay, Ocean Extreme operates the only adventure vessel with an unrestricted offshore licence. Once you pass all of Sydney's stunning harbour landmarks you will be taken offshore and out into the open ocean at speeds of up to 100kmph. It's here that adrenalin really gets pumping as you jump the waves on your journey down the coastline all the way to Bondi Beach for a photo opportunity not offerred anywhere else. Be sure to keep your eyes peeled for dolphins, whales, seals and penguins. Get Picked up from your Hotel in a European Sedan/ SUV or Luxury Van. Its a 4hr Tour Hotel to Hotel.Let us help you with our 4 hour city tour. We can tailor package our tour to suit your needs.Some ideas on what to see;Sydney Harbour Bridge (from many vantage points such as Mrs Macquarie's Chair to Milsons Point, – Sydney Opera House – Sydney Tower – QVB – Darling Harbour – The Rocks – Observatory Hill – Luna Park – Botanical Gardens – Bondi Beach – The Gap – Watsons Bay – Taronga Zoo.Prior to commencing our tour, our Chauffeur will ask you and find out what you would like to see and do, and we will take it from there with one of our experienced Chauffeurs. Get your family picked up in style from your Hotel in a European Sedan/SUV or Luxury Van. Its a 4hr Tour Hotel to Hotel.Let us help you with our 4 hour city tour. We can tailor package our tour to suit your needs.Some ideas on what to see;Sydney Harbour Bridge (from many vantage points such as Mrs Macquarie's Chair to Milsons Point, – Sydney Opera House – Sydney Tower – QVB – Darling Harbour – The Rocks – Observatory Hill – Luna Park – Botanical Gardens – Bondi Beach – The Gap – Watsons Bay – Taronga Zoo.Prior to commencing our tour, our Chauffeur will ask you and find out what you would like to see and do, and we will take it from there with one of our experienced Chauffeurs. Sydney's coastline will provide any city slicker with a much needed escape.Sit back and take in the beautiful sights of Sydney's coast as we pass through Coogee, Bronte, Tamarama, Bondi and Watsons Bay. Let your hair down and ride through Sydney's iconic Bondi Beach, soaking up the scenery from the back of a classic Indian Motorcycle.Take in the beauty of Sydney's famous Harbour Bridge, go beach as we ride through Bondi and take in the sights of popular Sydney suburbs. Explore the best of Sydney on this half-day city tour as you visit Sydney Harbour, Bondi Beach and the Rocks. Explore the iconic Mrs Macquarie's chair and view the Sydney Harbour Bridge from the perfect vantage point. Make sure to bring your camera as you discover the stunning architecture, colonial history, picturesque waterways and beautiful harborside suburbs that make Sydney the bustling city it is today. Spend one day sightseeing in Sydney and another day exploring the Blue Mountains with this combination of best-selling tours. Start in Sydney with a city and Bondi Beach tour followed by a Sydney Harbour lunch cruise. On the Blue Mountains day trip, visit Scenic World and Featherdale Wildlife Park; stop at Echo Point for great views of Three Sisters rock formation, take in the charms of Katoomba and Leura and enjoy a Parramatta River Cruise. You see so much in two days and get great savings by booking these tours together.Special Offer – Save over 17% on three of our most popular Sydney tours by booking this 2-day combo package! – Book Now! Take in the best of Sydney by land and water with a deluxe small-group city and harbor tour. Choose from two itineraries that include a luxury yacht cruise on Sydney Harbour to iconic sites including Sydney Harbour Bridge and Sydney Opera House. You'll also see the city by mini-coach with an expert guide. Highlights include Bondi Beach, Paddington, The Rocks, and Mrs Macquarie's Chair on this small-group tour limited to 14 people. See the sights of Sydney Harbour, the city skyline, and coastlineincluding the Opera House, Harbour Bridge, and Bondi Beachon a 20-minute scenic flight in a luxury helicopter. Includes pickup and drop-off from centrally located Sydney hotels. Select a morning or afternoon departure time when booking. Enjoy a comprehensive tour of Sydney with a top rated, professional and experienced Shore Excursion Tour Operator! See more of Sydney on this Ultimate Luxury Shore Excursion. From Bondi Beach to the City – You will visit all of the well known Sydney sights and attractions plus many more. Relax on your own Private Tour with a professional driver/guide! Relax and enjoy the luxury of your own Private Tour with a knowledgeable and friendly local Aussie guide on this 6 hour day tour. : Visit all the main Sydney tourist attractions and sights plus many more that the larger tour buses don't visit., This tour is perfect for anyone who is in Sydney for a short visit and wants to make the most out of their stay!, Enjoy the sights and attractions at your own pace, Visit all of the famous landmarks including the Sydney Opera House, Harbour Bridge, Bondi Beach, Manly Beach, See Sydney's historic colonial districts, . Being a Private Tour, there is plenty of time to stop and enjoy the scenery. Enjoy a delicious, complimentary morning tea and a stress-free pickup and drop off at your requested location in Sydney including hotels, cruise terminals, airport or other accommodation. Your city private city tour will reveal the very best of Sydney in the care of your local expert guide. Tours start at a time that suits you with pick up from your hotel, airport or cruise ship terminal. A half day tour, 4-5 hours with time in the city and a choice of the Northern Suburbs or across to Bondi Beach and the eastern Suburbs. The tour is yours, a private tour, so the trip is yours to decide. Start the tour where it all began for Australia in the historic Rocks precinct with our oldest buildings. From Observatory Hill, A short stroll reveals the Darling Harbour and new Barangaroo precincts below. Cross the Harbour Bridge for views from the North Shore, extend this trip to Mosman or head further to Manly or head to the eastern suburbs, to Watsons Bay, Paddington and the famous Bondi Beach. Enjoy a half day city tour of Sydney. Be prepared to visit Bondi Beach and Watsons Bay and seize the opportunity to see the Observatory Hill, Mrs. Macquarie Chair, Icebergs Resturant South Bondi, Balmoral Beach. Enjoy all of this with a local guide after being picked up at your hotel. Explore the majestic Blue Mountains with an expert guide on a full-day tour from Sydney. See spectacular views of the Jamison Valley, Three Sisters, Mt Solitary and more from lookouts such as Lincoln's Rock, Wentworth Falls and Echo Point. Three Rides at Scenic World are included. The Skyway, Railway and Cableway provide the best views of the Jamison Valley and a beautiful walk in the temperate rainforest. Lunch is included with a 5 menu option with a glass of beer, wine or soft drink. After Lunch you'll meet Australian critters at Featherdale Wildlife Park. Explore the wildlife park with wallabies, kangaroos, little penguins, crocodile and Koala's. At the End of the day you will return to Sydney on a Private Water taxi to Circular Quay or Darling Harbour for Diamond Tours customer only. 2nd Day you will experience at Half Day City Tour showing the highlight of the city, Bondi Beach and Middle Head. Blue Mountains Tour and City Tour Combo!! Max 14 People. Explore Sydney's famous Eastern Suburbs beaches form Bondi to LaPerouse on a trike, Harley Davidson or Indian motorcycle. All eyes will be on you as you feel the rumble of the engine and wind in your face – it's the only way to sightsee! Choose this morning or afternoon half-day Sydney sightseeing tour and explore Sydney highlights including incredible views of Sydney Opera House, Sydney Harbour Bridge, stroll along Bondi Beach. Step back in time as you learn about the historical Rocks precinct and discover the history of the convicts. Travel along Oxford Street and through the trendy streets of Paddington making your way to the Pacific Ocean along the cliff walk around Tamarama, Bronte and Bondi Beach. Return to Sydney via Double Bay, Kings Cross and Mrs Macquarie's Point for a final magical viewpoint over the harbour before returning to the city center. See the very best of Sydney on a private tour that takes in the city's historic center and beaches, colonial heritage and natural beauty. Admire the historic sandstone buildings on Macquarie Street, watch surfers catch waves at Bondi Beach, and cross the Sydney Harbour Bridge to visit the golden beaches of North Sydney. Choose the sightseeing tour only, or make a full day of it a day and upgrade to the lunch option at Collaroy Beach Club. Receive personalized attention from your expert guide on this comprehensive private tour of Sydney. Surf, party and explore Australia on this 7-day surfing trip from Sydney to Brisbane. Become a surfer and cruise the Australian coast in search of some of the best waves and fun in the sun. The great Australian surf trip awaits. You and your new surfy mates will tour the coast visiting iconic destinations where you'll surf, explore, party and relax. Your tour takes fun loving travelers on a true surf trip of Australia. All tours are flexible enabling clients to surf the waves when they are at their best whilst still ensuring you experience Australia’s beach culture, landmarks, wildlife, nightlife, and a guided tour at every new location. All tour guides are qualified surf instructors, taking beginners and intermediates from the foundations to stoked capable surfers. Make your dream to see Australia, and surf Australia a reality. Surf, party and explore Australia on this 7-day surfing trip from Brisbane to Sydney. Become a surfer and cruise the Australian coast in search of some of the best waves and fun in the sun. The great Australian surf trip awaits. You and your new surfy mates will tour the coast visiting iconic destinations where you'll surf, explore, party and relax. Your tour takes fun loving travelers on a true surf trip of Australia. All tours are flexible enabling clients to surf the waves when they are at their best whilst still ensuring you experience Australia’s beach culture, landmarks, wildlife, nightlife, and a guided tour at every new location. All tour guides are qualified surf instructors, taking beginners and intermediates from the foundations to stoked capable surfers. Make your dream to see Australia, and surf Australia a reality. Combine two great Sydney experiences into one with a hop-on hop off Sydney Harbour cruise and a hop-on hop-off city bus tour. The ferry pass is valid for 2-days and the explorer bus valid with your 24-hours. Explore Sydney and Bondi aboard an open-top double-decker bus and visit sites such as the Sydney Opera House, The Rocks, Chinatown and the Royal Botanic Gardens. On your Sydney Harbour cruise, ferry ticket covers travel between Circular Quay, Darling Harbour, ICC Sydney, Barrangaroo, Taronga Zoo, Watsons Bay, Luna Park, Manly, Shark Island and Fort Denison (Thu-Sun). This is the perfect way to experience the best of Sydney! Enjoy Sydney's spectacular eastern suburbs coastline from the beautiful Coogee, Tamarama to the famous Bondi Beach with your private tour guide who is a local Sydney expert. This tour showcases Sydney's spectacular beaches with unparalleled views of Sydney Harbour. Be picked up in a luxury sedan equipped with free wifi and a mini bar for your enjoyment. Enjoy breakfast with beautiful views overlooking Bondi beach before a short walking tour along the coastline. Stop for light refreshments or taste premium Australian wine in Watson's Bay and see Sydney's southern headland – the entry point to Sydney Harbour. Experience the scenic views of Sydney's amazing coastline from the Eastern Suburbs to the Northern Peninsula in comfort and style. As you are touring privately, anything is possible. Choose to end your day with a sunset picnic or a beach barbeque. Experience all the main icons of Sydney including the Harbour Bridge, Opera House, Botanical Gardens and more on your 5 hour essential Sydney tour. Enjoy lunch at the Cruising Yacht Club of Australia over looking Rushcutters Bay. Afterwards, visit the Iconic Bondi Beach and have time for a short stroll. See the main icons of Sydney including Harbour Bridge, the Sydney Opera House, and Royal Botanic Gardens on a 5-hour ‘essential Sydney' tour. Enjoy lunch at the Cruising Yacht Club of Australia overlooking Rushcutters Bay, and visit Bondi Beach, where you'll have time for a short walk. Hotel pickup and drop-off by air-conditioned vehicle is included. This half day Sydney highlights tour is just perfect to kick-start or end your holiday. See all the city hot spots and tourist icons: Sydney Harbour Bridge, the Opera, Mrs Macquarie's Chair, Woolloomooloo, Harry Cafe de Wheels, Rushcutters Bay, Point Piper, Rose Bay, Vaucluse, Shark Beach, The Gap, Bondi Beach, Paddington, Darlinghurst, China Town and Darling Harbour. En route, your expert tour guide will provide you with all the insight information you need to know as a first time visitor: where are the best beaches in town? Or the best walks, the finest restaurants or the most atmospheric Aussie pubs. In fact, this half-day Sydney tour will leave you with so many ideas and plans that you'll likely decide to extend your stay in the world's most beautiful city! This exclusive tour gives you the opportunity to design your very own perfect beach day out. The base of the day will be provided which will include private hotel pickup and drop off, touring and history of the area, private surf lesson, three course fine dining lunch, souvenir T-shirt/hat and photos on your very own surfboard USB. You will have your own private surf guide, who will be not only be extremely knowledgeable about the area but also a professional lifesaver and surf instructor. They will be able to work with you from the start of the day to ensure every need is met. Explore Sydney's most famous headland walk with your Bondi local guide. Discover why Bondi Beach is such an important part of Sydney's beach and coast life-style, the home of surf lifesaving and the famous Bondi lifesaver. Fun, interactive and informative our relaxed guided walking tour allows you to spend time with a true blue Bondi lifesaver and learn all about the colorful history of Bondi and how surf life saving began. Join your friendly local Bondi Surf instructor and experience Australia's most beautiful beach the way the locals do! Enjoy a half day Bondi Beach group tour that includes hotel transfers, surf lifesaving club tour, a surf or bodyboard lesson and a casual beachside lunch with 5 star views across Bondi. There are awesome sightseeing and photo opportunities and all equipment is included. This tours departs daily and will pick you up from your city accommodation at 10am and drop you home at approximately 2pm. You're never a tourist when you're cruising Bondi with your local guide. The Blue Mountains now World-Heritage listed, has deep gorges, steep cliffs, spectacular lookouts, excellent bushwalks and rich flora and fauna. On this tour, you'll discover the meaning of the name the Blue Mountains. You'll travel by clean, modern and air-conditioned buses on a personalized tour with friendly service. Your tour includes complimentary hotel pick up from most accommodation locations in the city center, as well as from central pick up points in Kings Cross, Darling Harbour, Coogee, Bondi, Manly and Glebe. Travel with passionate, friendly and qualified guides with local knowledge and extensive commentary as you visit the famous places and get off the beaten track. You've got Sydney covered on a four-day city stay that includes lots of free time so you can explore the city at your leisure. See the Sydney Opera House, Bondi Beach and other iconic sights of Sydney on a comprehensive city tour, take a cruise on world-famous Sydney Harbour, and travel into the hills to experience the beauty of the Blue Mountains. Accommodation, airport transfers and breakfasts are included on this hassle-free four-day Sydney city stay. Experience real Australian beach culture in one amazing day on Sydney's Eastern suburbs coastal beaches with a fabulous local guide. Experience the Bondi to Coogee Coastal walk through a locals eyes and discover some of the coasts hidden secrets. Begin early morning at Bondi Beach where you'll see where the beach the famous TV show ‘Bondi Rescue' is filmed, visit a local gallery and walk the stunning coastline past Bronte Beach to Coogee Beach. Enjoy breakfast and a locally brewed coffee at a quintessentially Bondi Café, enjoy a seafood lunch at the southern end of the coastal stretch on Coogee Beach. Learn the history of the area and important information about beach safety. Experience the very best of Sydney on your luxury private city tour. Your full day 8 hour private city tour will reveal the very best of Sydney in the care of your local expert guide. Tours start at a time that suits you with pick up from your hotel, airport or cruise ship terminal travelling aboard the fully appointed Land Rover discovery with full leather interiors, dual a/c, huge windows and lower-able air suspension for easy access. Enjoy refreshments and wifi on board and attentive guiding throughout the day as you see Sydney's most beautiful sights and hear about our fascinating history and local culture. Discover the classic sights like the Sydney Harbour, Opera House, The Rocks, Bondi Beach etc while also escaping the crowds to experience stunning local bushland and a sumptuous waterside lunch away from the hustle. As a boutique tour operator you are assured of an exceptional day out and the piece of mind of touring with a 5 star rated local company. Explore Sydney on a full day 8-hour private tour with a local private guide who will show you the real Sydney. Your tour of the city can be tailored to suit your preferences; see sights such as Sydney Harbour, the Opera House, and Bondi Beach with the option of including personalized experiences like galleries, architecture, museums, central suburbs, cafes, and restaurants. The tour is flexible to ensure you enjoy what interests you in a relaxed and local way as you travel in air-conditioned comfort. Enjoy the best sightseeing tour of Sydney on your half-day private tour. Discover the picture-perfect views from Mrs Macquarie's Chair of the Sydney Opera House and Harbour Bridge. Learn about the city's rich history and culture from your expert guide. Visit the very tip of Sydney Harbour at The Gap, and the dip your toes in the ocean at the famous Bondi Beach. Travel through the exclusive suburbs of Paddington and Vaucluse and the notorious Kings Cross. Choose this 3-3.5 hour walking tour from Bondi to Clovelly and enjoy the stunning sights of this coastal walk. Admire the stunning views, relax in the beachy culture and spot the quirky murals along the way. An introductory tour of Sydney, visiting some of the main sites of the city. This tour is exclusively for your group of 1-7 guests. Pass through the historic Rocks area, where European settlement began. Take in spectacular views of Sydney Harbour from a number of vantage points which offer great views of Sydney Opera House and Sydney Harbour Bridge. Travel through trendy suburban neighborhoods and stop at famous beachside areas including Bondi and Manly. 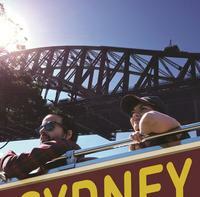 See the sights of Sydney and Bondi while you're in port in Sydney with a hop-on hop-off tour. Travel in an open-top double-decker bus, and see the best of Sydney on this shore excursion, with the freedom to get on and off whenever and wherever you please. Listen to the interesting commentary and spend as much or as little time at sights including Circular Quay, Kings Cross, the Rocks, Paddington, Double Bay or Bondi Beach before jumping aboard for the next stop — the choice is yours! Fly above Sydney and its famous landmarks on this great-value 20-minute Sydney Helicopter Tour! A Super Saver scenic helicopter flight takes you into the skies for fantastic aerial views of Sydney's photogenic attractions, including the Sydney Harbour Bridge, the Sydney Opera House and Bondi Beach. What better place to learn to surf than on world-famous Bondi Beach? Here you'll find fantastic waves, sunbathing beauties, year-round sun and the coolest beachside vibe anywhere. Join a two hour group surfing lesson, or for the ultimate experience, take a private surfing lesson with your own personal instructor. Capture the essence of Sydney on this afternoon coach tour of the city's many famous attractions, including the Sydney Opera House, Sydney Harbour Bridge and the Royal Botanic Gardens. you'll also explore the popular suburbs of Kings Cross, Bondi Beach and Paddington; see the historic Rocks district; view the sparkling waters of Sydney Harbour from Mrs Macquarie's Chair; and discover lively Darling Harbour.Special Offer – Book and travel by September 30, 2018 and save 27% off our previously offered price! – Book Now! See Sydney's spectacular icons, such as the Sydney Harbour Bridge and World Heritage listed Opera House, from the comfort of your lunch time harbor cruise before spending an afternoon touring Sydney and her eastern suburbs. Visit the site where Sydney began, The Rocks, as well as the world famous Bondi Beach, Sydney”s Red Light district of Kings Cross and much more! Discover Sydney and its surroundings on a full-day tour that combines a morning visit to Manly with an afternoon tour of downtown Sydney and a drive out to see The Gap. Throughout the day you'll get great photo ops of the Sydney Harbour Bridge, Sydney Opera House, Manly Beach, Bondi Beach and other iconic sights. Have the choice to upgrade with a luncheon cruise on Sydney Harbour. You'll see so many highlights of beautiful Sydney on this full-day tour with a knowledgeable guide! Explore Sydney and Bondi Beach on this hop-on hop-off sightseeing tour, which takes you by double-decker bus to 34 stops around the city including Sydney Opera House, Sydney Harbour Bridge, Darling Harbour, Bondi Beach and more. Enjoy unobstructed views and recorded commentary on board. Simply hop off to walk around and sightsee in depth. Your ticket is valid for 24 or 48 hours, so you can experience Sydney and Bondi's most noteworthy attractions, sights, and shopping and dining areas at your own pace.Special Offer – 2 Days for the price of 1! Book a Classic 1 Day Ticket and travel by August 31, to receive an upgrade to a 2 Day Premium Ticket (to be used over 2 consecutive days) – Book Now!